An amnesiac Data is responsible for accidentally exposing a pre-industrial alien society to radiation poisoning. Meanwhile, Troi takes the test to become a bridge officer. Finally, a decent hook, with Data all messed up and walking into a pre-industrial society with a radioactive suitcase. That's how you get the audience's attention. It's great suspense to have Garvin handling the radioactive rocks without anybody but the audience knowing what they are. Gia: "She went to a beautiful place where everything is peaceful and everyone loves each other and no one ever gets sick. Do you think there's really a place like that?" Data (looking longingly at the stars): "Yes, I do." It's corny, sure, but it's a nice nod to Roddenberry. Of course, on the Enterprise, not everything is peaceful, not everyone loves each other, and people still get sick, but it's the thought that counts. It's nice that Talar finally says "I don't know" when Gia asks her what's wrong with Garvin. Though she often comes across as arrogantly certain of the most obvious psuedoscientific nonsense, she does have some scientific inclinations in there somewhere. It's important to cut the woman some slack, because even our most celebrated intellectuals and scientists of years gone by harbored some ludicrous notions about how things work, simply because science progresses slowly and by correcting centuries of deeply-embedded misconceptions. I'm glad Troi asks Riker if this is an unfair test, given our knowledge of the Kobyashi Maru and the fact that, just one episode ago, in "Lower Decks," Worf gives Sito Jaxa an unfair test to make a point. Troi talks about how the events of "Disaster" are the main catalyst for her seeking to become a bridge officer, and in that episode, the major disagreement she has with Ensign Ro is that Troi is unwilling to potentially sacrifice the lives of the crew when it becomes clear that the warp core is about to breach. In this episode, Troi's main problem in qualifying to be a bridge officer is her reluctance to order a crew member to his death in order to save the ship. Nice character consistency. It seems kinda shady that Troi can just walk into the holodeck and run the test on her own. That's cheating, right there. 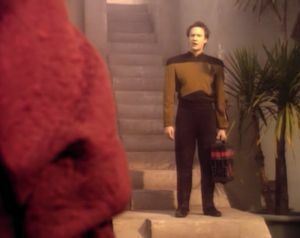 How did Riker walk into the holodeck during the simulation without Troi noticing? While it is possible to treat acute radiation sickness, the kind of miracle cure Data cooks up doesn't really exist (yet). Carl Sagan likened science to a candle in the dark, as a ray of rationality in a cold and superstitious world. The A-story with Data reminds me of this, because Data is walking into a deeply superstitious society and bringing with him a philosophy of reason and empiricism. It's an excellent nuts-and-bolts approach to Data as a scientist, and the use of amnesia as a plot device is perfectly acceptable since audiences are more likely to buy it from an android than they are a human. I also like the B-story with Troi taking the bridge officer test, though I can't find any tangible connection between the two halves of the plot. Regardless, there's some great writing and acting going on, so I will forgive the lack of thematic cohesion. When Worf is promoted to Lieutenant Commander in Star Trek: Generations, there's an elaborate ceremony on the holodeck to celebrate. Troi doesn't appear to get such fanfare for her promotion.